Just a reminder that MAST is taking a survey to gather information for the MAST Users Group and to help us prioritize our plans for improving and expanding archive services at MAST. So take a few minutes to fill out the survey at http://archive.stsci.edu/survey2009.html. The survey will remain open through June 14, 2009. We are pleased to announce the availability of Data Release 3 (DR3) of the Hubble Legacy Archive (HLA), delivered on May 26, 2009. The HLA is an augmentation of the Hubble Space Telescope data archive service. Its goal is to optimize the science coming from the telescope by providing immediate access to enhanced archival products, including combined data, extracted spectra, source lists, and user-contributed high-level data products, directly through a browser interface. The project is a collaboration between the Space Telescope Science Institute (STScI), the Space Telescope European Coordinating Facility (ST-ECF), and the Canadian Astronomy Data Centre (CADC). Reprocessed NICMOS single exposures and combined images, including most of the data taken prior to the NCS installation. These NICMOS images take advantage of a significantly improved calibration pipeline, and for the first time provide deeper, cleaner drizzled combinations of multiple overlapping images taken within a single visit. 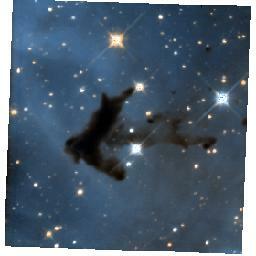 To the right is a drizzled Level 2 (combined) NICMOS image of the Carina nebula included in the DR3 data. This color image is produced from F110W and F160W data obtained with NIC3 in Program 7907, with a total depth of one orbit. Individually validated spectra for 1235 objects observed with the ACS GRISM. These spectra, provided by ST-ECF, were extracted from two pointings that had been taken parallel to the NICMOS UDF observations close to the GOODS field south. Data include a wavelength- and flux-calibrated spectrum, a direct image, and the two-dimensional extracted GRISM image. 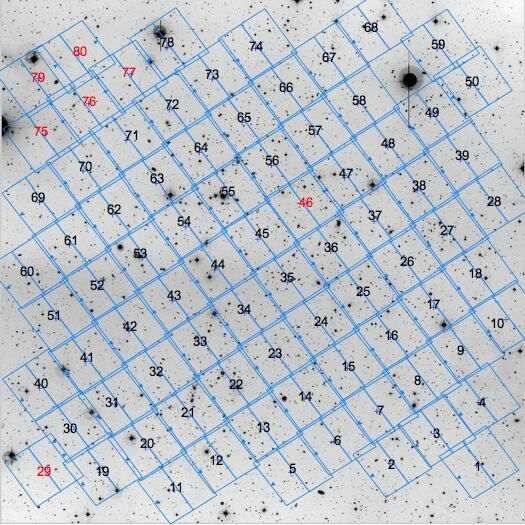 To the right, the preview of the extracted GRISM spectrum of a z=2.82 BAL QSO (an X-ray source identified in the Chandra Deep Field South) included in the DR3 data. The preview includes a plot of the spectrum, a direct image, and a cutout of the two-dimensional GRISM data. A similar preview is available for each extracted target. Preliminary source lists for about 80% of the WFPC2 science data, including both DAOPhot and SExtractor lists. Both sets include aperture magnitudes within a 0.1 and 0.3 arcsec radius, and an estimate of the CTE correction based on the Dolphin prescriptions. Source lists can be overlaid on the image data through the Interactive Viewer integrated within the HLA interface. To the right is a region of the Antennae showing the objects in the corresponding DAOPhot source list released in DR3. WFPC2 image with DAOPhot source position overlay. Sample prototypes of ACS mosaics, which combine overlapping data obtained over multiple visits with the same detector/filter combination. Mosaics can be substantially deeper and cover a much larger area than single-visit combined images. At this time, only 8 mosaics have been released, as examples of the type of data that may be produced in the future. Because of the complexity involved in the definition and processing options for mosaics, community input will be critical in shaping future offerings in this area. Mosaics are identified as Level 3 data in the HLA Search interface. 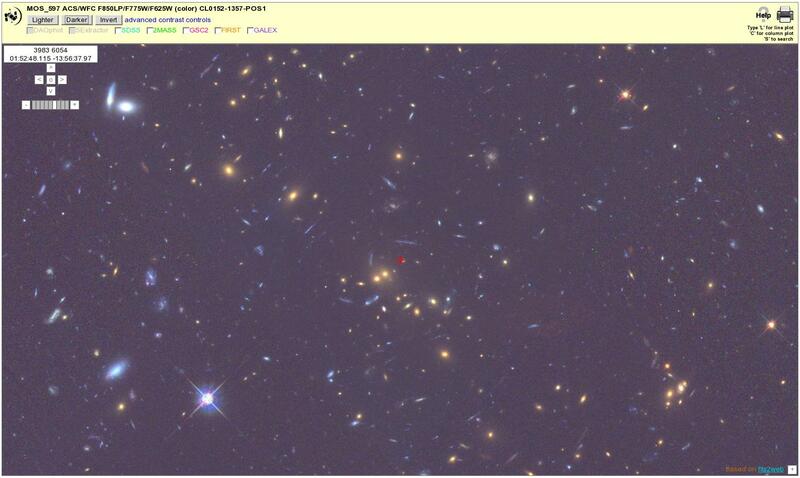 To the right is a section of Mosaic 597, consisting of 8 visits on galaxy cluster CL0152-1357. The color image is a composite of data in F625W, F775W, and F850LP, for a total of 57200 s in 8 visits laid out in a 2x2 grid. This is one of 8 mosaics released with DR3; processing of these mosaics is fully automated. We also remind HLA users that a large fraction of user-contributed High-Level Science Products, consisting of almost 5,000 images produced from ACS, WFPC2, and NICMOS data, were made available through the HLA interface as part of Data Release 2.5 on December 22, 2008. These products are identified as Level 5 (Contributed) data in the HLA Search interface. All data available through the HLA can be searched, displayed, and retrieved through a variety of integrated tools, including search by position in the sky, instrument, and proposal ID; display and selection through the footprint of the data projected onto the digitized sky survey image; visualization as cutouts or through an interactive display tool; and retrieval through a "shopping cart" mechanism which also provides an interface to standard MAST retrieval services. MAST has always been the source for the user community to access FUSE data, but with the end of FUSE operations, the FUSE team at JHU and MAST personnel have worked together to design a completely revamped site that will be the long term home of the FUSE mission on the web. The site not only includes access to enhanced data products, but also contains new documentation written specifically for archival users. The enhanced data products include a fully reprocessed and re-calibrated science data set from the mission, performed with the final version of the CalFUSE pipeline, CalFUSE 3.2, which was updated after the end of FUSE operations. Several other supporting elements have been added to the Quick Look page for FUSE data that provide added value to archival users. These include Mission Planning Schedule plots that show the scheduled observation in the context of orbital activities, Guide Star plots, which are handy for confirming aperture orientation on the sky, and Science Data Assessment Forms, which provide the user with additional information about how the observation in question actually executed on orbit. In addition, the new site includes general information about the FUSE mission and its history. A "Mission Overview" is available for the general public, as well as descriptions of some of the FUSE mission's scientific accomplishments. Much of the relevant material from the mission site at JHU has been transferred to the MAST site for general information and for future reference. This includes mission status reports, users group minutes and status presentations, and an image gallery. We invite you to visit the archival FUSE site and familiarize yourself with the new format and products. If you have comments or questions related to this site, please contact: archive.stsci.edu. Since the Sloan (SDSS) DR7 dataset was released last year, MAST has received requests to provide cross-matching searches for targets overlapping in both surveys. As part of an inter-institutional agreement, Drs. Tamas Budavari and Sebastien Heines of Johns Hopkins University have provided cross-matching tables for the two surveys. These have been deployed at MAST and can be found at the GALEX CasJobs site (http://galex.stsci.edu/casjobs/). To access this service, you will need to register to CasJobs if you have not already done so. A Tutorial with several SQL queries will walk you through some exercises - see http://galex.stsci.edu/doc/casjobsxtutorial.htm). Please get back to us if you have any problems or would like to see additional example queries. We plan to utilize the cross-correlation catalog in GALEXView over the next few months. Final processing of the WFPC2 data began last fall and is now 87% complete. For data that have been reprocessed, users may request data in either standard multi-extension FITS (MEF) and/or wFITS format; the default is currently the waiver FITS (wFITS) format traditionally used by WFPC2. Eventually the default will become MEF. For data not yet reprocessed, only the wFITS format is available. For more details, please visit the WFPC2 web site. In early February, the archive began reprocessing NICMOS data acquired prior to 2008. We have completed 63% of the NICMOS data set. Any new NICMOS data taken after 2008 will use the OTFR system for now. Requests for data sets that have already been reprocessed are filled using the new static archive. Data sets that have not yet been reprocessed will be calibrated using the OTFR system. The operations staff maintains a webpage with the status of the reprocessing effort. The ACS Nearby Galaxy Survey (ANGST) team undertook a systematic, complete, and carefully crafted imaging survey to establish a legacy of uniform multi-color photometry of resolved stars for a volume-limited sample of nearby galaxies. The Primary Investigator for the project is J. Dalcanton. The set of HLSP include binary fits tables of photometry for the ANGST sample as defined in Dalcanton et al. 2008. Also included are associated reference images and raw photometry tables. The data are archived at MAST and may be downloaded from the MAST ANGST Website. With multiwavelength data available from COMBO-17, HST, Spitzer, XMM-Newton, GALEX, 2dF and GMRT the survey goals included simultaneously linking galaxy morphology with other observables such as age, star-formation rate, nuclear activity, and stellar mass. In addition, with the unique multiwavelength dataset and new high resolution mass maps from gravitational lensing, they were able to disentangle the large-scale structure of the supercluster. By examining all aspects of environment they planned to determine the relative importance of the dark matter halos, the local galaxy density, and the hot X-ray gas in driving galaxy transformation. Although STAGES was a multi-instrument survey the data products archive at MAST include only the reduced HST/ACS images for each of the 80 tiles in the F606W ACS mosaic, as well as postage stamps for all objects in the field and the complete output of GALFIT profile fitting. Visit the MAST STAGES web page for more information and links to the data products. For more information about the survey and to download the associated STAGES master catalog visit the STAGES home page. STAGES tiling pattern overlayed on the ground-based COMBO-17 R-band image. 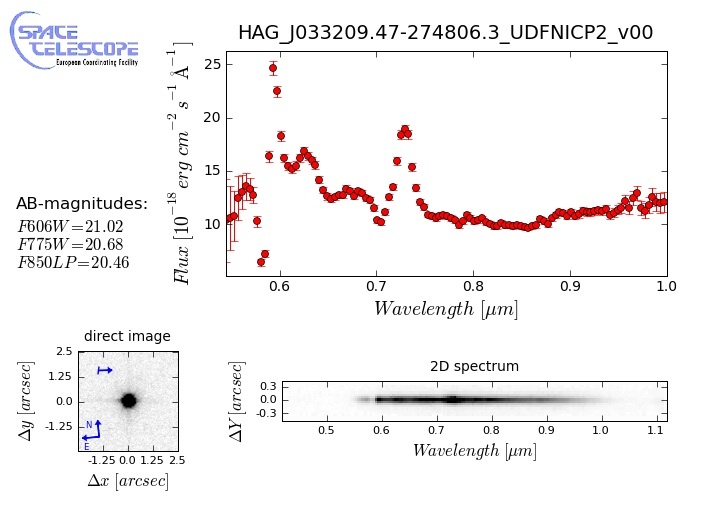 In 2008, the Hubble Heritage Team obtained WFPC2 mosaic data for NGC 3324 with the [O III] and [S II] filters (F502N and F673N). The resulting color composite image was released in October 2008 to commemorate the 10th anniversary of the team. This area is adjacent to the large ACS H-alpha Survey of the Carina Nebula and other smaller nearby fields. The NGC 3324 data have been released as HLSP. Max Mutchler and his team are producing HLSP for the remaining and much larger set of Carina Nebula data. These data should be released later in 2009. Until then, please visit the MAST Carina Nebula webpage for more information about these observations and links to the data NGC 3324 data products. The HST 18th Anniversary press release contains a large gallery of interacting and merging galaxies. Max Mutchler made a small number of these galaxies available has HLSP. Recently, he augmented the initial set with data for additional merging and interacting galaxies. The set now includes these targets: Arp 194, Arp 274, Arp 147, NGC 6050, Arp 148, ESO 69 6, and Arp 87. See the Merging and Interacting Galaxies webpage for access to the data and a description of the products and the reduction steps for these data. MAST now has a search interface for papers from refereed journals that have used data from missions archived at MAST. We have always looked for and maintained records of papers that use MAST related data and shared that data with the ADS. 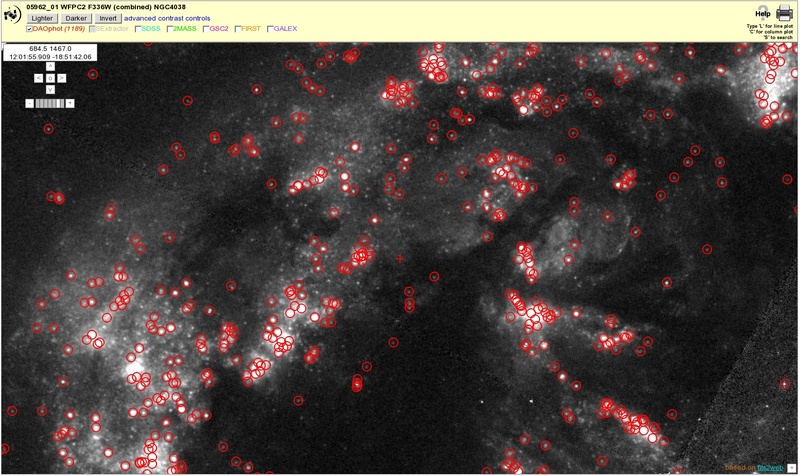 Now we are making those records searchable at http://archive.stsci.edu/bibliography/index.html. While we work hard to find papers that use MAST data, we know that we have probably missed papers. If you find that we are missing a paper that used data, even in a supplementary way, please send mail to the archive@stsci.edu with the details. We would love to hear from you!